Police say a California woman robbed a bank and fled to a Pacific Gas & Electric office to pay her utility bill. The Fresno Bee said the woman was arrested shortly after the Bank of America heist. Kinda makes you long for the days when a good old-fashioned bank robbery netted you enough to buy diamonds or retire for life. Now it only pays the electric bill. Hawaii’s economy closely follows California’s…so I expect to see a rash of bank robberies here, since Hawaii’s kiilowatt per hour electric cost is five times higher than the mainland’s. That’s another one of those shockers that people experience when they move to Paradise. I hang my clean laundry and sheets on the clothesline, as do most of my neighbors. It’s a lot more work that way, almost like doing the laundry twice, vs. tossing it into the dryer, but it shoots our electric bill sky high if we use the dryer. There is no natural gas on Maui. 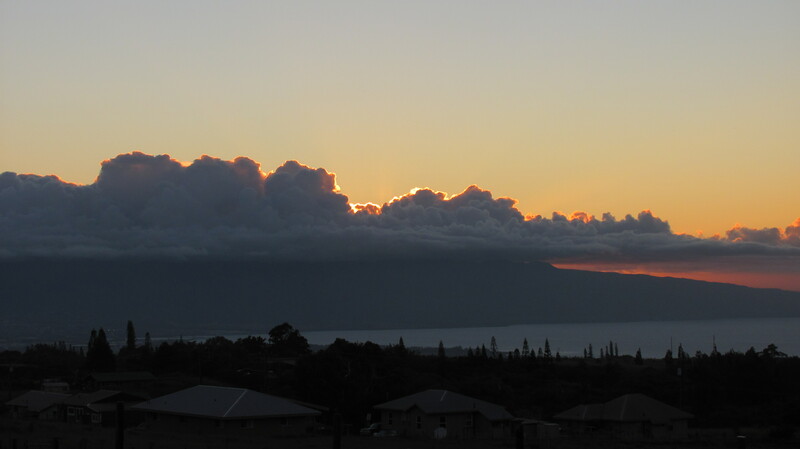 But for these many things that make living on Maui so very expensive, there is a silver lining. Each time we get in the car to drive anywhere, we are treated to sublime views. I never tire of heading down the mountain and seeing the cloud formations over the West Maui Mountains, seeing the pinky-sunset hues shoot up into the sky and color those clouds every evening. On our way out to dinner for Mike’s birthday, we saw this, the very essence of a silver lining. It’s been doing this every evening for a week now. I’ll never grow tired ot it. A hui hou (til next time). If you’d like to subscribe to this blog, please click the Follow button on the Home Page. Mahalo for reading! Colleen’s at the Haiku Cannery http://colleensinhaiku.com/location.html is an out-of-the-way gem mostly frequented by the locals, but it would be an excellent stopping-off point on a trip back from Hana for the tourists. When you come to the Haiku Community Center, make a left and then another left onto Haiku Road, and up to the Cannery, which will be on your left also. It’s across from the Haiku Post Office. On our visit for Mike’s birthday, we saw one tourist couple waving a Maui driving map about, but other than that it was an interesting mix of locals who could have been doctors or windsurfers, sitting next to the guy with hair halfway down his back….and bare feet. Only in Hawaii. We went on a Friday night and waited about thirty minutes for our food, but the service was good and the wait staff attentive with refilling water glasses. Colleen’s ambience reminds me of something you would find in Berkeley or Benicia, the town I was from in California. It has a restful vibe and they’re doing it right with the portions and flavors. The the only thing missing for me is artwork–a place for the eye to land. So I had to content myself with people-watching. The place was packed and all tables full during the dinner hour (we arrived at 7 pm, with no reservation). Don’t stand at the door and wait, because it’s seat-yourself. Mike had the special: mahi-mahi with tiger prawns in a beautiful beure-blanc sauce that was excellent. We detected a hint of saffron. It came with a large scoop of fluffy, not gummy, rice and asparagus, for $25.00. I had the Warm Bacon Spinach Salad for $14.00. It was quite large, had crispy potatoes, carmelized onions, cherry tomatoes, fresh bleu cheese and white truffle vinaigrette. If anything there was a little too much dressing and bacon in it (full slices, unusual for this salad.) In addition to their full pizza menu, the dinner menu is imaginative and it would appear there is something for everyone: BBQ Baby Back Ribs in a Maker’s Mark Honey sauce, a Shrimp and Garlic Linguine, Wild Mushroom Ravioli for the vegetarians (very important in Haiku) and a Vodka Penne Pasta, in addition to the Burgers and Fresh Daily Catch. I saw a number of Fish and Chips baskets come out, so they must be worth trying, if that’s your thing. We were too full for dessert. We grabbed their breakfast and lunch menus also and plan to go again soon. The breakfast menu is typical and includes an Organic Tofu Vegetable Wrap. For the vegetarians, lunch includes a Grilled Ono and Avocado Wrap (if you eat fish) and a Roasted Vegetable Wrap. The place is clean, comfortable (lots of booths, a biggie for me) and the noise level surprisingly low for concrete floors and high ceilings with an open-kitchen plan. Give Colleen’s a try if you venture to Hana, or make it a destination with a pretty drive and side trip to Paia or Makawao. I think you’ll be pleased. A hui hou (til next time). If you’d like to subscribe to this blog, please click the “Follow” button on the Home Page. Big news on Maui. Costco opened their gas station! We who live here have been waiting and waiting for this, we have been gouged on gas for so long… With rumors of price-fixing and legislation trying to get that stopped…But now Costco has come in and solved the problem. They dropped our gas prices by a dollar a gallon! Could it be we will no longer have the highest gas prices in the whole nation?